With this product you can accumulate up to 71 Glitter Points. 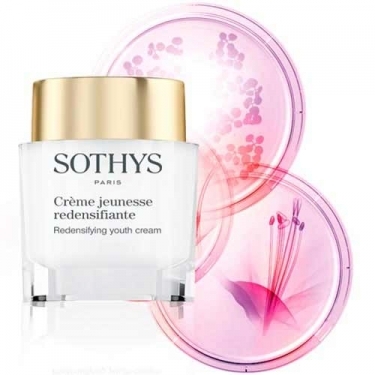 DESCRIPTION: Crème Jeunesse Redensifiante from Sothys is a cream for the recovery of a resplendent complexion and full of vitality attenuating the signs of aging. Perfectly regenerated, the skin becomes redensified. Active Ingredients: BP3. 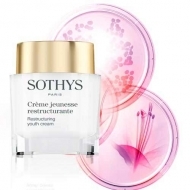 Tri-Complex Safran-Sophora-Peptides, an association of saffron and sophora with peptides of last generation allows the skin to fight against oxidative stress and fight the signs of aging chronological; Alisma peptides, to strengthen the skin barrier function; Extract Kombucha, to visibly reduce wrinkles and regrow the skin; Bamboo pear extract and urridic acid, to visibly prolong the youth of the skin.